Fifty recumbent tricycles set off from Portland, Ore. on a cross-country trek to raise awareness for sustainable transportation. Photo by Okocicle Bikes & Trikes. The city of Boston, Mass. launched its first bike-sharing system on Thursday. Philadelphia’s public transport agency, SEPTA, announced bounding growth in ridership with more riders in the past 12 months than in any of the past 22 years. A bus rapid transit system (BRT) was proposed for the city of Bhubaneswar, India at a meeting of the Unified Metropolitan Transport Authority (UMTA) this week. The worsening condition of U.S. surface transportation infrastructure is projected to deter the country’s economy by roughly 870,000 lost jobs and $3.1 trillion in lost GDP between now and 2020, asserts a new report from the American Society of Civil Engineers. Brampton, Ontario’s new BRT system, dubbed “Züm,” closed out its first six months of service with record-high transit ridership numbers. The bus system boasts 1.4 million rides in March—a 26.5 percent increase in ridership from the previous year. Forty-three rail passengers lost their lives in a collision of two trains—a Beijing-to-Fuzhou train and a Hangzhou-to-Fuzhou train—in China this week. Minister of Railways Sheng Guangzu has since demanded a full investigation into the cause of the collision. Ideas for By the City /For the City, an urban development competition, are due by this Sunday at midnight. Submit your idea now! The fourth annual Making Cities Liveable Conference was held this week in Queensland, Australia. The conference focused on a variety of topics, including climate change, coastal urbanization and technology in cities. All Washington, D.C. parking meters now feature a pay-by-phone pay option. Eight smart grid pilot projects in India are planned for the next 18 months. The initiative’s objective is wise management of the country’s electricity load flows. Sustainable Development Technology Canada awarded C$17M (US$17.9 million) to 17 new “clean technology” projects, including those in the areas of transportation, agriculture, mining and energy. India announced new national plans for environmental protection management. Under the first major announcement from new environment minister Jayanthi Natarajan, India will be divided into zones and a national institution will be in charge of environment protection within each zone. A new report by TNO revealed that the U.S., French and German car fleet renewal schemes following the 2008 economic crisis failed to meet their safety and environmental objectives. This morning, U.S. President Barak Obama announced the new U.S. fuel economy standard of 54.5 miles per gallon to be achieved by 2025. Delaware’s Gov. Jack Markell signed a three-foot bicycle-passing bill into law for the state on Monday. Delaware is the 19th state in the union to enforce this safety practice. The state of California celebrated its fifth consecutive year of decreasing traffic crash fatality rates. The number of fatalities in 2010 dropped to 2,715, a nearly 12 percent decrease from 3,081 fatalities in 2009. The benefits of employees commuting to work by bike was articulated by a study of QBP employees, who between 2007 and 2011 generated an additional $301,136 from gained employee productivity and achieved an average 4.4 percent reduction in per member per month health care costs. Capital Bikeshare of Washington, D.C. announced a partnership with three D.C.-area hotels to offer hotel patrons complimentary 24-hour memberships to the bike-sharing program, as well as helmets, maps and educational biking materials. The U.S. Postal Service will honor bicycles in a new four-stamp postage series featuring images of bicyclists. 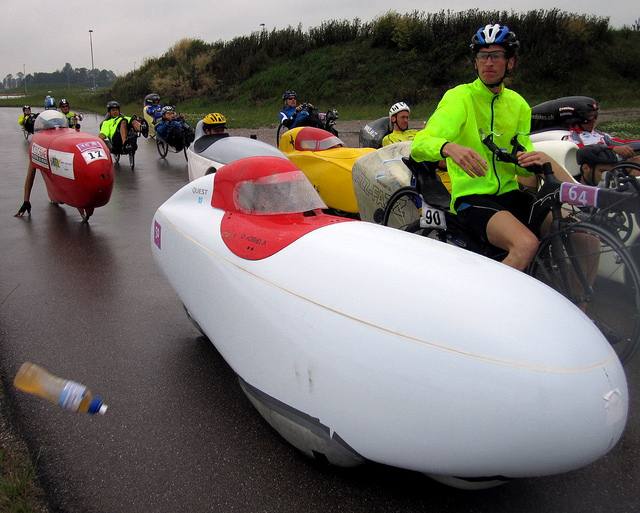 A pack of 50 velomobiles, or recumbent tricycles, set off Thursday from Portland, Ore. on a cross-country, high-visibility trek to Washington, D.C. The event is to raise awareness for sustainable transportation and was organized by Roll Over America. Tags: active transport, Asia, Barack Obama, Beijing, Bhubaneswar, bicycle legislation, bike-sharing, Boston, Brampton, bus rapid transit (BRT), Canada, Capital Bikeshare, China, competition, France, fuel economy, Fuzhoum, Germany, Hangzhou, India, North America, parking, Philadelphia, Portland, road safety, smart grid, sustainable development, TheCityFix Picks, train crash, transit ridership, United States, urban governance, Washington, D.C.